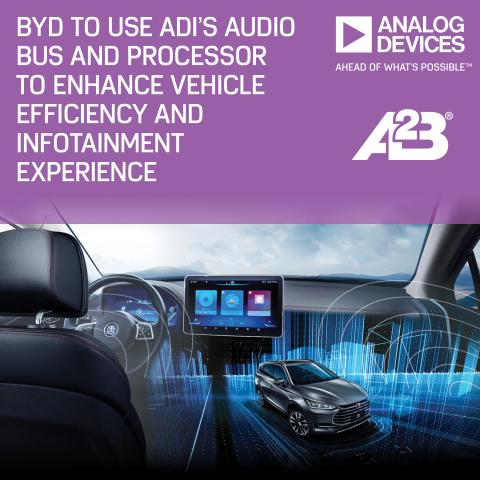 NORWOOD, Mass.--(BUSINESS WIRE)--Analog Devices, Inc. (Nasdaq: ADI) today announced that BYD Co., Ltd, a Chinese automotive manufacturer, has selected ADI’s Automotive Audio Bus (A2B®) and SHARC® digital signal processor (DSP) to build more energy efficient and eco-friendly vehicle platforms while enhancing the immersive audio entertainment experience for drivers. This release may be deemed to contain forward-looking statements intended to qualify for the safe harbor from liability established by the Private Securities Litigation Reform Act of 1995. These forward-looking statements include, among other things, our statements regarding the advancements in technologies and expected product performance that are based on our current expectations, beliefs, assumptions, estimates, forecasts, and projections about the industry and markets in which the companies operate. The statements contained in this press release are not guarantees of future performance, are inherently uncertain, involve certain risks, uncertainties, and assumptions that are difficult to predict. Therefore, actual outcomes and results may differ materially from what is expressed in such forward-looking statements, and such statements should not be relied upon as representing Analog Devices' expectations or beliefs as of any date subsequent to the date of this press release. Important factors that could cause actual results to differ materially from the results described, implied or projected in any forward-looking statements include difficulty or delay in our design, development, production and marketing of products, technologies and solutions and other risk factors described in Analog Devices’ most recent filings with the Securities and Exchange Commission. Analog Devices does not undertake any obligation to update forward-looking statements made by it. A2B and SHARC are registered trademarks of Analog Devices, Inc. All other trademarks and registered trademarks are the property of their respective owners.